Don’t Text and Drive – No matter what your business or personal interests are, you can raise awareness about avoiding texting while drive to curb instances of dangerous, distracted driving. This magnet serves as an inspiring token and advises the youth and others to drive safely without distraction. 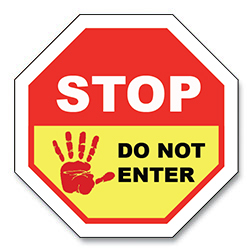 If you are operating in a telecommunication or automobile industry then, promote a “Don’t Text and Drive” campaign through octagon magnets to inspire your customers, clients and employees to drive safely on road. Fire Safety & Prevention– Death from fire is the fifth most common cause of deaths in the US. You can employ this octagon magnet for raising awareness about fire safety and prevention and aid in downsizing the death rates. It makes one impressive choice of value building during the month of October, when national fire prevention week is observed. Firefighters – As, you all know firefighters play a very important role in our life; they risk their lives to help people in despair. They need to be honored and respected in what all ways we can. If you think, firefighter tribute makes it all special and you can always grab this magnet and start gifting it straight during or after Fire Safety and Prevention Week in October. National Crime Prevention Month – National Crime Prevention Month is observed in every October to raise awareness about crime prevention. Over the years many products such as bumper stickers, key chains, and balloons have been employed for raising awareness about crime prevention. Awareness octagon shape magnet 2.25×2.25 is a perfect way to trigger long term awareness about the prevention of crime in youth. This magnet will help in stirring consciousness in youth and catapult successful crime prevention efforts. National Impaired Driving Prevention Magnet – December is observed as a National Impaired Driving Prevention Month where awareness is raised about drunk, distracted, drugged driving. You can do your bit to raise awareness about the cause by handing out a National Impaired Driving Prevention awareness octagon shape magnet 2.25×2.25. It can be handed out during tradeshows, social awareness campaigns and other events, where large participation is expected. National Poison Prevention Week – Poisoning is one of the most widely reported causes for death in North America. Every year 2 million cases of poisoning are reported across Poison Control Centers in America and about 90 percent of those cases are occur at home or accidental usage of poisons. You can do your bit by stirring consciousness about poisoning and prevention during the National Poison Prevention Week or at all other times. This awareness month is observed in third week of March, you can inform people about the poisonous products and measures of prevention. The most effective away of spreading awareness is through awareness octagon shape magnet. People can retain it over their refrigerator or working cabinets and remember the key points. Sexual Responsibility Awareness Week – Sexual awareness is one of the most widely speculated and debated issues around the world and in America. Most people are tightlipped about its awareness and other issues surrounding it. Every year Sexual Responsibility Awareness Week is observed in February. You can hand out octagon shaped magnets during the week or other times. Sexual responsibility awareness aids to cut down the raising cases of sexual transmitted diseases and other health concerns surrounding it. You can involve awareness octagon shaped magnet 2.25×2.25 in many other ways to raise voice against stigmas or causes or concerns that exist in society or are widely ignored. You can avail exciting discounts and benefits of free shipping, free arts set up and free design proof by ordering from some reputed online custom magnets store.